Automologist, MAC, is back with updates on the Lotus-based electric sports car from a little factory in the UK. Way back in 2013, we announced on this very website the arrival of another and altogether neater Lotus Elise-based, electric-powered sports car. So very many motoring writers seemed to believe that this was not going to happen and the Detroit Electric SP:01 was little more than vapourware. (See: Detroit moves to Holland). The pocket rocket sports car did indeed have its fair share of pre-production hiccups that would have made many industry insiders believe that this was indeed vapourware. Well, I am happy to announce that all of the naysayers can go eat some humble pie, because the SP:01 is starting to roll off the production line from the company’s brand new production line near Lemington Spa in the UK’s midlands. It’s not the first electric car that uses an Elise as a starting point; the original Tesla Roadster also had the lightweight Lotus as a base. The Tesla two-seater was powered by a battery pack that contained 6,831 Li-ion cells, so it was pretty fast. 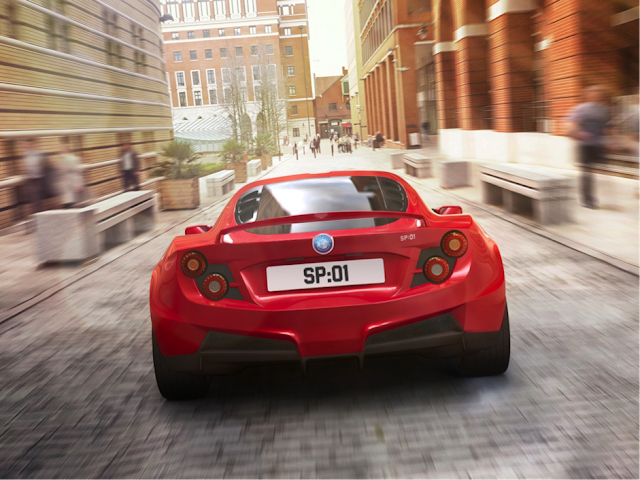 We expect the SP:01 to be at least on par in the speed department, and with a carbon fibre composite body covering the chassis of bonded aluminium, it is 140lbs lighter than the Tesla Roadster, tipping the scale at 2,590lbs. Still, it’s 500lbs heavier than the petrol variant of the Elise. Lotus models tend to have a simple cabin space, sans all the creature comforts and techy accoutrements, to achieve lower curb weight. But the SP:01 doesn’t eschew completely those cushy interior features that we are accustomed to – like bolstered sports seats upholstered in leather or Alcantara. And its 285 hp electric motor, which drives the rear wheels, should remedy the extra heft. Transmission options are a standard single-speed or optional two-speed automatic; there is also a six speed manual version, which can propel from zero to 60mph in 3.7 seconds, and onward to a limited top speed of 155mph. The door trim, dashboard trim and doorsills are customisable, and there are some aluminium trims. But, this is after all a sports car, so embellishments are not top priority. Of course, first impressions of the SP:01, if you don’t know anything about it before, is that it looks like a defunct Lotus project car. To build each SP:01, in fact, Detroit Electric starts with a complete Elise rolling chassis from Lotus, including the front and rear suspension and bonded-aluminium chassis. We know then that the SP:01 has at least a good mechanical base. The Lotus connection goes even deeper than that. Detroit Electric’s new head, Albert Lam, was once upon a time the CEO of Lotus Engineering Group and the executive director of Lotus Cars of England. If you want to rush out and buy one you may have to hang on for a while for whilst the first few have rolled off the production line and sent to undisclosed buyers, there is still no announcement on the price and if you want one in the US of A, then tough luck as there are no plans to sell them outside of Europe and some lucky Asian countries at the moment. Lam, who announced the SP:01 with a heavy emphasis on the stars and stripes back in 2013, doesn’t take the company’s geographic incongruity lightly. “We are Detroit Electric, not London Electric,” said Lam, who seems to have conveniently forgotten that Detroit Electric’s Headquarters are now in Holland. “Our commitment to the city of Detroit, the state of Michigan and the United States is as strong as it ever was.” Now, when I was growing up we had a saying ‘love is a verb’, so whether Lam can turn affectionate words into action remains to be seen. The company has promised that if the UK-built sports car does well, it will build a production facility in its namesake city to produce a clean-sheet electric sedan.